Crusaders in Frankish Greece, Athens, Guy II, majority AD 1294 to 1308. Billon denier. Guy II de la Roache was a minor with joint rule with William de la Roache from 1287 to 1294, and then as an adult sole ruler 1294 to 1308. This coin was issued during his majority of 1294 to 1308. Denomination : Billon denier. Mint : Athens. 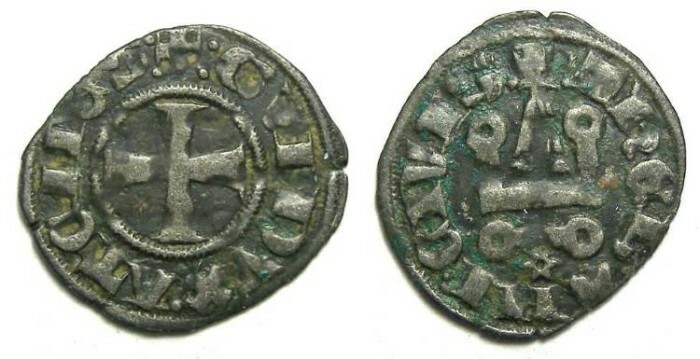 Reference : COINS OF THE CRUSADER STATES - Pages 388, #96 variety (Rowel below castle). Size : 16.7 x 19.2 mm. Weight : 0.88 grams. Grade : VF with a slightly dark grey tone. Obverse : Short cross with GVI DVX ATENES around. Reverse : Castle tournois, with a rowel below, with ThEBANI CIVIS around.